Within Veeam v9 there are a couple of new nifty features. Below are 2 new features that are very useful on remote site’s, but not really big mentioned on internet. a quick recap below and more info on these parts, follow the links. The load on the backup server was high. Starting from Veeam Backup & Replication 9.0, the task of deploying the runtime process in a Microsoft Windows VM is performed by the guest interaction proxy. The guest interaction proxy is a backup infrastructure component that sits between the backup server and processed VM. The guest interaction proxy deploys the runtime process in the VM and sends commands from the backup server to the VM. The guest interaction proxy allows you to communicate with the VM guest OS even if the backup server and processed VM run in different networks. As the task of runtime process deployment is assigned to the guest interaction proxy, the backup server only has to coordinate job activities. The mount server is required if you perform restore VM guest OS files and application items to the original location. The mount server lets you route VM traffic by an optimal way, reduce load on the network and speed up the restore process. When you perform file-level restore or application item restore, Veeam Backup & Replication needs to mount the content of the backup file to a staging server. The staging server must be located in the same site as the backup repository where backup files are stored. If the staging server is located in some other site, Veeam Backup & Replication may route data traffic in a non-optimal way. From the remote site to the local site — to mount the content of the backup file to the staging server. From the local site to the remote site — to restore files or application items. To prevent VM data from traveling between sites, Veeam Backup & Replication uses the mount server. The mount server acts as a “mount point” for backups on the backup repository. 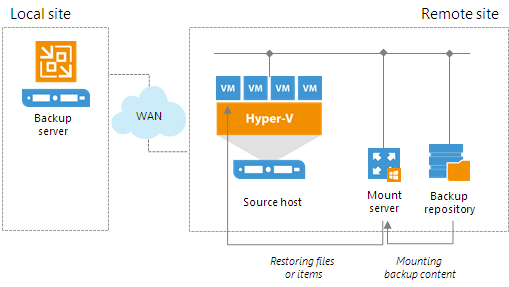 When you restore files or application items to the original location, Veeam Backup & Replication mounts the content of the backup file to the mount server and copies files or items to their destination via this mount server. Backup server. For Linux, shared folder backup repositories and deduplicating storage appliances, the mount server role is assigned to the backup server.